What is it about Tesla cars – any model – that makes otherwise reasonable people lose their everlovin' minds, you ask? That's easy: INTOXICATION. We will be talking about the current Tesla electric vehicle lineup here. Tesla's first offering was the 2008 Roadster. It was discontinued in 2012, but plenty of them are still on the road today. 100 people got handbuilt roadsters in 2008, including filmmaker Chris Paine, whose documentary “Who Killed the Electric Car?” influenced so many of us to drive, and even build, our own electric cars. Those lucky 100 got to pay 100 thousand dollars (up front) and wait for their car to be built. Full disclosure: I didn't think that would work out. It looks like I was mistaken. Despite production delays, the Roadsters got built and the customers loved them. Wait, capitalize that: LOVED. THEM. (That's more like it.) The intoxication had just begun. 244 miles on a charge. That was a LOT of electric range back in 2008. 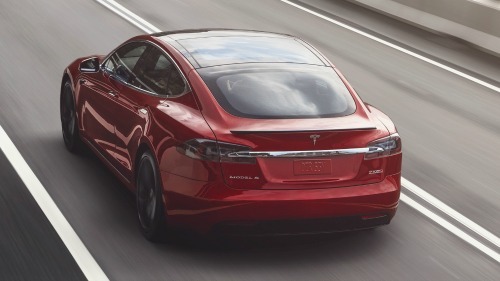 Today's Tesla Model S has 335 miles of range. 0-60 in 3.9 seconds. That, and similar, would become Tesla's trademark: acceleration from a standstill. The Model S can accelerate from 0-60 in 2.5 seconds. Ludicrous, right?? Yeah. More on that later. In February of 2018, Elon Musk launched his Tesla Roadster (2008) into space on the SpaceX Falcon Heavy rocket. Bye, Starman! See ya around the asteroid belt. The Tesla cars website says, when you click on “Model S”: The Best Car. It's a big, heavy luxury car that looks so sporty. You could sure say that the Model S is the best looking of all the Tesla offerings currently in production. I just love the way it looks from absolutely every angle. Gorgeous! It looks amazing in ALL the colors, but the RED one is my secret crush. What delectable goodies does the Model S come with? 0-60 in 2.5 seconds. Yes, you read that right. Insane? Ludicrous? Well, exactly! The P100D version of the Model S has a setting called “Ludicrous mode” that allows you to launch yourself and your unwitting passengers from 0-60 in 2.5 seconds. There is also “Insane mode” which is the same idea but 0-60 in 3.2 seconds. 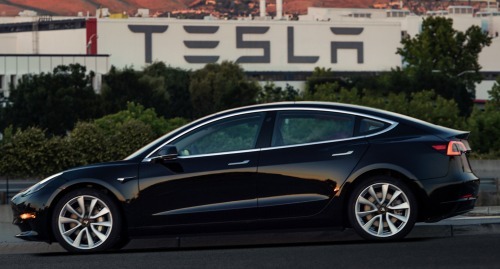 Not all Teslas cars have Ludicrous and/or Insane mode, it's the ones with P (performance) in their name and a bigger battery pack such as the 100 kilowatt hour version has. 335 mile range. Recharge at a supercharger for 30 minutes and get 170 miles back. Summon. You can call your car, and it comes. There is also the opposite process, where you can put it away remotely. Automatic lane change. The sensors and cameras around your Model S detect where the other cars on the highway are located, and you can use this feature to have the car change lanes for you - instead of craning your head around, signaling, dodging, weaving, screaming at the other drivers, and giving them the finger as you pass. I can't imagine why anyone would want this. Isn't driving supposed to be a sport?? Side collision warning. The cameras and sensors. There are something like 8 of them all around your Model S. Some of them aren't even in use yet, just installed and waiting for future updates to make them useful. Auto park. (Oh, yes please!) You can use it to parallel park for you. You can use it to park in someplace inhumanly tight, and summon your car out later. You can use it to park in your garage. The first thing you notice is the falcon wing doors. Right? Love them or not. (I'm not really a fan, but your mileage may vary.) 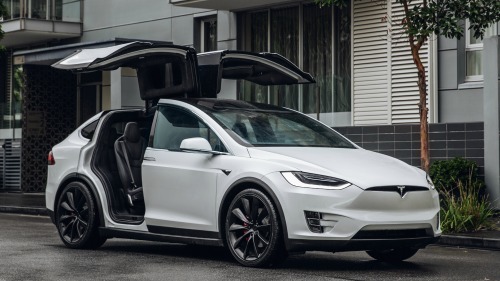 Watching the videos on YouTube, though, I could really appreciate how much easier it is to get a toddler into a carseat with the falcon wing doors and the extra height of the Model X vs. the low slung Model S.
250 miles range. Doesn't seem like much, by Tesla cars standards, but this is a heavy car and that's still a lot of miles. Push-button doors. On the Model S the door handles pop out. On the Model X, they are just door-handle shaped buttons that you push. HUGE windshield. The driver gets a panoramic view in the Model X. It's almost like having a sunroof in the front, unblocked by the structural parts of the car's chassis. If you get claustrophobic driving a little tin-can sports car, but you still enjoy sports car acceleration, this is your Tesla. Storage space. There's a frunk and a little rear storage, both very small in the Model X, but depending on your seat configuration, you can put the third row seats down and free up a LOT of cargo space. Seat configuration. 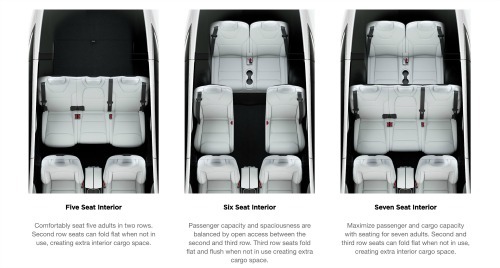 You can get your Model X in a 5 seat, 6 seat, or 7 seat configuration. 5 seat version: has a rear bench seat for passengers and a lot of storage space behind, similar to my LEAF. 6 seat version: has two seats per row. The rear seats can fold down individually to free up more storage space if needed. The beauty of this configuration is that without the middle seat in the middle row, there is more legroom for the rear passengers to stretch out. Another option with the 6 seater is a console in the center space for storage and drinks. 7 seat version: has two seats in the front and rear rows and three seats in the middle row. If you want a Tesla car but also sort of need a Greyhound bus for all your passengers, this might be your car. Move over Momma bear, Papa bear: Goldilocks says this Tesla is JUST RIGHT. It's light (for a Tesla car) and quick (as you'd expect from a Tesla). It's the price that really makes this car stand out, though: 35K base price with the 50 kwh battery pack. 0-60 in 4.8 seconds. That is with the 75 kwh pack. The 50 kwh version has a 0-60 time of 5.6 seconds, which is still pretty thrilling. To compare, my 24 kwh LEAF has a 0-60 time of 7 seconds, and I can still make the passengers scream. Maybe that's just my driving though. 310 mile range. Also with the 75 kwh pack. 50 kwh version has a 220 mile range. Your phone is the key. There is a card, credit card sized, that you can use as a key for your Model 3, but that's just for guests. For you, there's a Tesla app for your phone. 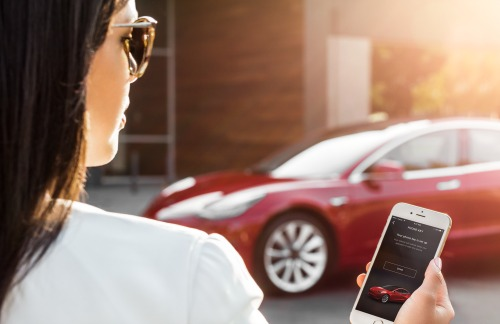 What does the Tesla cars app do? Unlocks and locks automatically. Approach your car with your phone in your pocket, and the Model 3 unlocks for you in anticipation. Climate control. You can preheat or precool your car remotely. Open the trunk or the frunk. Valet mode. Reduces acceleration and locks the cars settings. Because trust issues. Charging control. Set the timer, see your car's state of charge while you are elsewhere having lunch, open the charge port, that sort of thing. Find my car. With a map display. If your Model 3 is ever stolen, this feature will make the police really, really happy, because your iPhone will lead them straight to your missing car. You don't ever have to worry about range anxiety on a cross country trip. 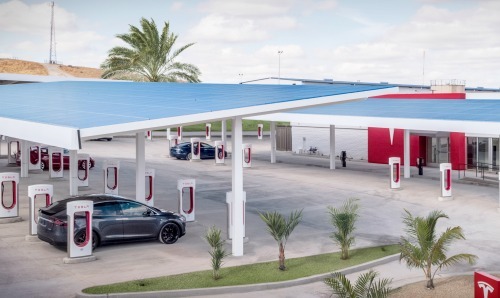 There are Tesla superchargers all across the US and around the world, and more being built every year. They are conveniently situated next to restaurants and attractions so you can grab lunch while you charge. With all these features and good looks too, you are going to LOVE your new Tesla car!